NOTE: This model replaces the JD302BRC and JD302B . It is the same as the JD302BRC except it now has an input on the face plate for a MP3 player/or ipod. Picture shows JD302BRC New pictures are coming soon! 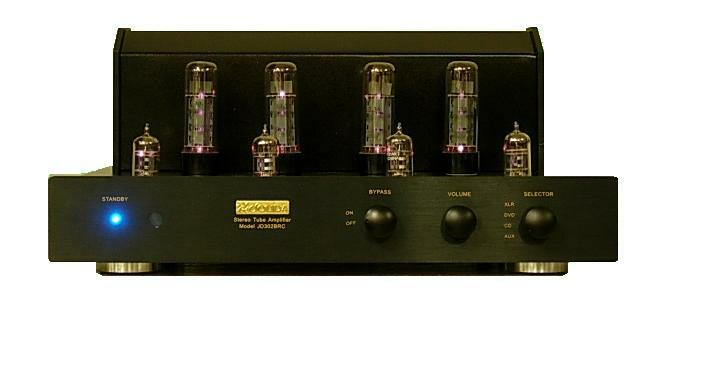 Fully Integrated Stereo Amplifier: Input 500mV driving 50 watts, maximum 75 watts output. Multiple Inputs: Front mounted selector switch-CD, DVD, Tuner and Aux (for TV, VCR, or Computer). Easy Biasing with top panel bias testing terminal with bias adjustment controls. State of the Art Components: Blue ALPS audio potentiometer, gold plated RCA input jacks. 2 matched pairs (4) of 6CA7/EL34 power output; 2 pcs. 12AX7A/ECC83 pre-amplifier; 2 pcs. 12AT7/ECC81 power drivers. 110V-120 VAC 60Hz 180 watts-standby, 450 watts maximum (220 VAC 50Hz option). 17 inches (43cm) wide by 15 inches (38cm) deep by 7.5 inches (19 cm) high. 39 pounds (18 Kg) net, approximately 46 pounds (21 Kg) packaged. Two year limited parts and labor. One year or 1000 hours whichever comes first on Jolida Tubes.